I spend a fair amount of time on the road doing consulting, lecturing, meeting with manufacturers, and recently shooting videos for Catapult (more on that at a later date). 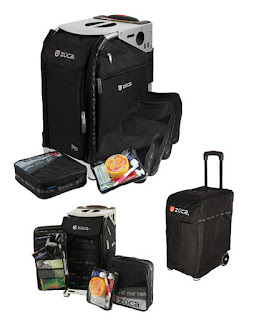 Developed for the seasoned road warrior, the ZÜCA Pro is a PATENTED new concept in travel that protects your valuable gear and provides a place to sit. You can also use the seat as a platform for carrying additional gear. Measuring 19" x 13" x 10" the Pro fits in the overhead compartment of standard commercial aircraft from 737's up. Easily roll down narrow aircraft aisles with an adult friendly 41 1/2" telescoping ergonomic handle. With the ZÜCA Pro, you will always have the best seat in the house. That's right, you can actually sit on your luggage and not worry about tipping or damaging it. Pretty neat huh? The bag is priced at $285 and can be ordered from the website. Thanks for highlighting our ZUCA Pro, John! I also wanted to point out that this is a great product for dental products sales reps.